On Wednesday, April 4, 2018, former Secretary of the Navy John H. Dalton announced his endorsement of Colonel Doug Applegate (USMCR retired) for California’s 49th Congressional District. After graduating with distinction from the U.S. Naval Academy in Annapolis, Dalton received naval nuclear power training and served aboard the submarines USS Blueback and USS John C. Calhoun. He ultimately attained the rank of Lieutenant Commander while in the U.S. Naval Reserve. 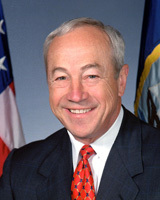 John H. Dalton was appointed Secretary of the Navy under President Bill Clinton in 1992 and served in this position until November 16, 1998. Additionally, Mr. Dalton has served as the President of Government National Mortgage Association of the U.S. Department of Housing and Urban Development, Chairman of the Federal Home Loan Bank Board and on the President's Advisory Council on the Arts from 1999 to 2001. He has held four presidential appointments requiring confirmation by the United States Senate and has over 40 years of experience in policy and strategy in government and financial services organizations. “I am proud to endorse Colonel Doug Applegate for Congress. He is the perfect candidate to represent the needs of the Camp Pendleton community, Southern California, veterans and promotion of economic growth for the 21st century. His many years of legal and military experience combined with his ideals are what CA-49 needs.” said Mr. Dalton. “It is a great privilege and honor to receive the endorsement of former Secretary of the Navy John H. Dalton; someone that I highly respect and served under as a Marine Officer. When elected to Congress, I will continue to serve our Marines and Sailors, veteran community, working families and put Country before party,” said Applegate.